NGO Monitor has obtained information on a new Amnesty International BDS initiative, which will be launched on Wednesday, January 30, 2019. Continuing an antisemitic campaign of Human Rights Watch and other NGOs, Amnesty will target Airbnb, Booking.com, Expedia, and Trip Advisor. The documents indicate that Amnesty International is largely basing its publication on tendentious claims from local NGOs. Amnesty’s attacks on the Bible and Jewish history come against the backdrop of extensive, deeply-rooted antisemitism at the NGO. 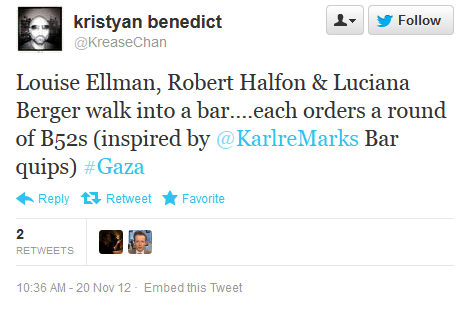 In November 2012, Benedict tweeted, “Louise Ellman, Robert Halfon & Luciana Berger walk into a bar…each orders a round of B52s… #Gaza” – labeling three Jewish MPs as warmongers. At least three officials of Amnesty International were members of the virulently antisemitic Facebook group “Palestine Live,” including Alli McCracken (Advocacy Director for MENA at Amnesty International USA) and Alex Neve (Secretary General of Amnesty International Canada). David Birkett, who describes himself as a fundraiser for Amnesty International UK, shared highly antisemetic articles and statements, including Holocaust denial in the group and on his personal Facebook page. The journalist who exposed the Facebook group, David Collier, notes that one of the Admins tagged Amnesty International UK crisis response manager Kristyan Benedict (see above), suggesting that Benedict was once a member and/or is Facebook “friends” with a leader of this antisemitic group. In 2015, Amnesty co-sponsored a speaking tour in the United States for Bassem Tamimi. Tamimi was convicted in 2012 of encouraging Palestinian youths to throw stones at Israeli soldiers. His appearance in a third grade classroom sparked outrage, and the school’s superintendent denounced the remarks as “inflammatory.” Tamimi has, in addition to inciting violence, expressed support for antisemitic sentiments including the claim that Israelis detain Palestinian children to harvest their organs and that the Zionists control the media. Instead of recognizing antisemitism as a human rights issue worthy of attention, Amnesty instead adds to the hate by targeting the Jewish state.